Wohooo! Today is my 27th birthday. Goin to be an old man already. Good Life! I received lots of birthday wishes yesterday.. through SMS and phone calls. 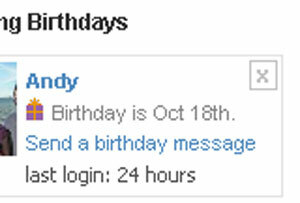 Even my long lost friend also still remember my birthdate! Huhu.. Thanks all! I think I need to thank Friendster for reminding “some” of them. Most of them, perhaps? Thanks for helping! Happy Birthday, Andy. I really thank God for all the things He has done in my life. Yea. p/s: Hey reader. Wish me a bit lar. It’s Been a Month. I’m a Daddy. Because there is no one wishing you good luck here, so I be the one. Happy birthday dude. Although it is late. selamat ari tua… sungguh x aci exabyte.. aku masuk sejak 2002.. x pernah dapat apa2 pung… memang depa x aci.. muahahahaha.. ok aku nak tanyer khabar.. sudah ko tanam ker notebook ko tu.. lupa pulak aku nak mintak charger dia?